On Monday, November 13, 2017 the MPAA sponsored an educational seminar. Dr. Shoudang Wang presented on the topic of Acupoint Thread Embedding Needling, a technique he developed which is used extensively in China and the USA. Dr. Wang has clinics and practices in both Beijing, China and New York City, USA. Topics discussed included the benefits of Thread Embedding Needling for facial rejuvenation, spinal health, and weight loss. Dr. Wang demonstrated this technique for shoulder pain, weight loss, and body shaping. He also demonstrated the benefits of Chinese massage for the treatment of lower limb edema. 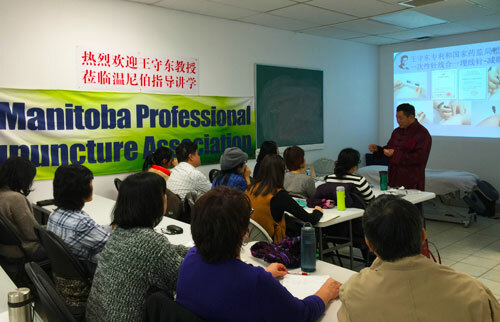 The course was attended by 14 acupuncturists from the Winnipeg area. Participants received 5 credit hours toward continuing education.